Salesforce has grown into a popular data management tool for nonprofits with designated offerings like Salesforce Nonprofit Success Pack (NPSP). Upon application of the NPSP, many organizations recognize their internal demand exceeds the Success Pack’s capacity. Most nonprofits in the United States have between 15 to 200 additional apps (i.e. Quickbooks) to supplement some of their varying data challenges. We hope this page sheds connects you to the information you need to better understand your current Salesforce infrastructure and equips you with insights for optimization. 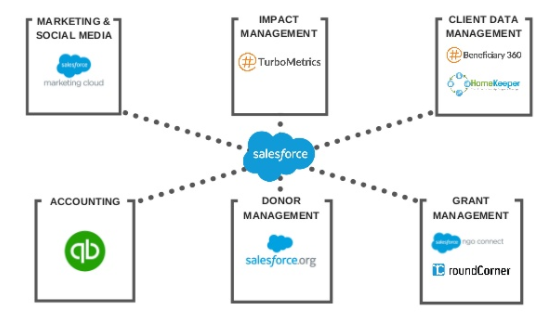 While Salesforce offers the social sector access to robust data management tools, complexities in the usage can limit an organization's ability to implement Salesforce for Nonprofits to its full capacity. 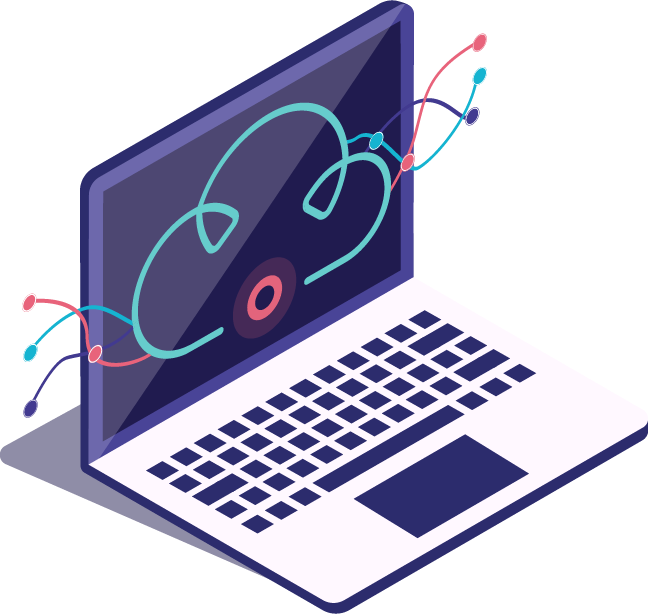 Cloud Integration tools are able to connect your various applications for a streamlined data sharing ecosystem in your operations. Learn about this process and how integration can work for you. SoPact has identified three common Salesforce integration strategies that apply to nonprofits and their funders. Learn more about each strategy and discover your solution. 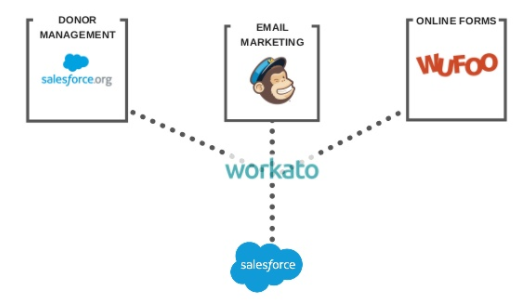 From Workato to Jitterbit, there are many different tools for cloud integration. Learn about the various options and what system works best for you. Salesforce is a robust cloud platform. While they are giving away platform with zero startup cost, nonprofit should be careful to use Salesforce in specific use cases. Relationship between funders and non-profit could continue to evolve. While basic quantitative results collection is possible with Salesforce, quantitative results collections can often blindside funder and not provide appropriate context related to social impact measurement. 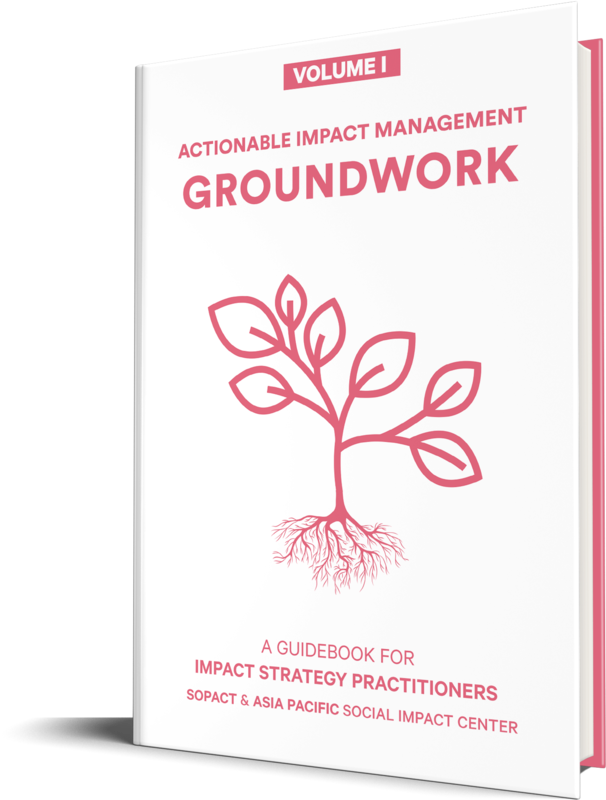 Often many foundation who have started the journey to aggregate results from grantees takes a long time as designing a truly scalable social impact results collection is difficult as most grantees have unique social impact context. Use Salesforce Integration approach when there is a need to keep two or more system results in sync. .
At its core, integration is the sharing between applications. It is most often the sharing of data between applications. And while integration is not specific to Salesforce, Salesforce for nonprofits is turning out to be the cloud platform of choice for many non-profits, foundations & impact funds. Typically the implementation of Salesforce integration grows overtime from simple data management into a comprehensive ecosystem of connected applications. In fact, It is not uncommon to see nonprofits go from 1:1 app integrations to the integration of 150 apps within a decade. Possible applications to integrate include QuickBooks and Intacct for Accounting; Salesforce Nonprofit Success Pack for Donor management; among many others. As our use of applications grows, so does our need to manage all the data. Integration allows this to happen by aggregating or managing all of our diverse data sets in one place. So what’s the dotted line? What connects our various apps to a hub like Salesforce? 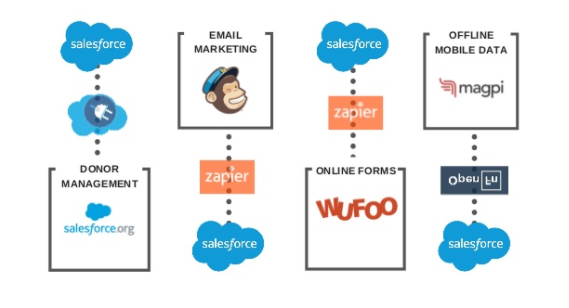 “Cloud Integration” tools like Zapier and Workato are the glue that connect your applications. As your investment in applications grows, it’s important to consider your data management now and into the future. This includes your processes to manage your application ecosystem, the user experience of this process for your employees, and of course, the level of security that you need to maintain. Cloud Integration tools provide built-in integrations for applications (in the industry, we call them recipes). They are the easiest form of integration compared to customized solutions. Now that we know the different pieces that make up integration strategies: the applications and the cloud integrations, let’s look at our three strategies. The first is for a one to one app integration. Fairly straight forward, this cuts back on manual entry of data for a very focused purpose. 2. Average complexity | Single-Input, Multi-app Internal Integration: This strategy achieves the same objectives as the first, however ,involves a greater number of apps. Average builds upon the first – but includes more apps within the integration, furthering the benefits of this effort. Typically this involves integration with business application like Oracle, NetSuite, WorkDay, and so on. 3. Complex | Data Integration with an External System: This strategy, among other things, solves complex grant management reporting requirements. And finally, the complex integration, what we call Data Integration with an External System is a highly customized solution that enables a diverse array of activities coordinated for external systems such as grant reporting in HomeKeeper & HUD Connector that we built for Grounded Solutions. If you are wondering how to proceed, which integration strategy works best for you, take time for considering these 5 aspects. What applications do you need to be integrated? To what end? Do you simply need the data aggregated in one place? Or do you need to have it shared between applications? What kind of data are you integrating? Your financials, contacts, client information? What integration layer will you be working within? Data? Process? UI? Security? With that, let’s look a little deeper into the three strategies. First is our Single-Input, Single-App Internal Integration. As you see, there are four separate examples of this type shown here. Each has it’s own purpose, and it is fairly straightforward. Simple integrations, we selected three primary options for the glue – or cloud integration tools that we can use. 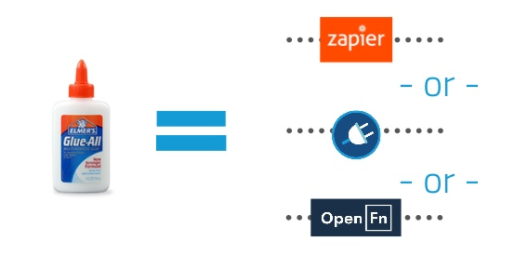 Zapier is popular and simple to use. It is not just for Salesforce, but for over 750 applications. Salesforce Connect is primarily used for simple and direct data to data integration between Salesforce and another application. And OpenFn is designed for International Development application integrations such as Magpi, SurveyCTO, DHIS2 and many common data management in the field. 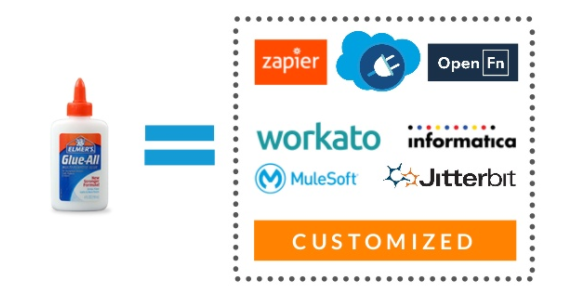 In this strategy, as you can see, various apps are being integrated using the same “glue” – or cloud integration tool – Workato. More than the last strategy, this allows you to coordinate between multiple applications through rules and workflow through a highly visual tool. 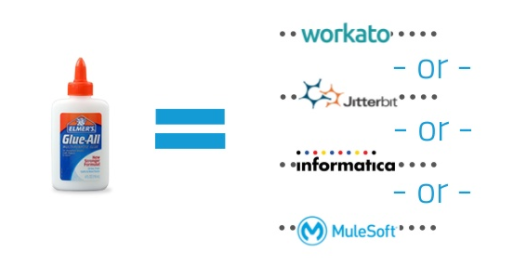 The integration clouds for Average complexity strategies like this are slightly more robust, they include Workato, Jitterbit, Informatica, and MuleSoft and various others which are all different from one another, but overall solve similar types of application integration needs. Our final and most complex strategy, ‘Data Integration with External System’ is implemented for very specific external integration needs. These cases are very technical in nature and require a great deal of custom development for their cloud integrations. On the screen you will see our case study for the day, with an integration between Grounded Solutions’ HomeKeeper app and the Housing and Urban Development’s Housing Counseling System. No matter which strategy you take for integration, to make it successful we need to go beyond just integration. We need effective analysis of the data and the reporting of the findings. We hope this has equipped you with some insights for your own data management journey. Happy to hear from you - What integration questions are you left with? I remember two years ago, sitting in the office of the Texas nonprofit where I worked, hearing the word "Salesforce" being slung around like a bad overdone joke. Now, I reside at a SaaS startup in the Bay Area where Salesforce reigns king. Indeed, the new Salesforce mega-office (still in construction) already towers over the financial district casting an impressive shadow. Salesforce is a powerful tool that made an intentional decision to extended a do-good arm to the nonprofit sector with its 1-1-1 model. So what's the hangup? Where is the power of the tool losing its prestige amongst nonprofit staff and instead becoming the obstacle everyone bonds over during lunchtime? I decided to reach out to my previous co-worker, Andrea Earl, who was the product manager for the program that used Salesforce to try and find some insights. Below are Andrea’s observations around a few key areas: (A) Report Feature; (B) Add-Ons; (C) Usage; (D) Training; and (E) Advice for other nonprofits using Salesforce. Reports are so important to nonprofits for multiple reasons. For us, the reporting feature helped us make sure we were meeting our timelines and helped us with grant writing purposes. Salesforce’s report feature was pretty basic, but served our general need. There were hang-ups though. If you ran the same report multiple times, you would sometimes have different findings. Reports weren’t always accurate and when the report doesn’t always come out correctly, that doesn’t give the staff much motivation to consistently stay engaged. Add-ons add up. Nonprofits are used to being resourceful - and pride ourselves on it. We used the basic features - so we never enjoyed the full capacity of the system. For example, with the reports, the basic function gave a surface-level analysis of the numbers. To go deeper, we would need to invest more money. However, we could not afford to go deeper than the numbers. The process of inputting data must be done correctly. However, in nonprofits we deal with complex realities and if you end up needing to change fields of data you are filling in, you have to go back and retrain everyone all over again. What’s more, everyone at the nonprofit technically should be clued in to the details of Salesforce and the data, but unless they are trained about how the data is useful to them, there is little motive. From my experience, the staff and volunteers of nonprofits that are tasked with data recording are not fluent in the language of technology. While there are many training materials out there for Salesforce, none of them (that I have found) are written for such crowds. What’s more, larger projects like ours with a lot of volunteers (who were responsible for inputting data) require cycles of constant training. This takes up a lot of time - and since the material is above everyone’s heads, it’s not very effective. To get around these problems, some hire a third-party consultant for the trainings. However, this is expensive and since there is no standard, different consultants will train in vastly different ways. This can further serve to complicate an already complicated process. We found that it was better to adapt the training manuals as best we could on our own. This can be a frustrating experience though. Make sure everyone is trained on it and get it to a place where it will be most helpful for everyone on the team. This take time and planning. Don’t just throw it together quickly. Overall, it seems that Salesforce, while a deeply powerful tool is not designed around the unique needs of traditional nonprofits. Many nonprofits do not enjoy the system to its full capacity. Furthermore, even at it’s most basic functional level there are great challenges for user experience by nonprofits. It seems as though better training material - adapted to the language and common usage of the tool by nonprofits might be a possible short term solution. Data is an important piece of the work done by the social sector - we should help ensure the integrity of that data. Background of Salesforce in non-profit. Nonprofits and foundations for many years have been using hundreds of systems often custom and packaged client/server systems. Among many popular systems out there today have been Blackbaud, Social Solutions and hundred of small & medium size vendors. While many modern cloud based SAAS based applications have emerged such as nationbuilder, classy, Salsa and many other payment processing system. While, most of them have a strong fundraising platform, it is important to understand distinction between two larger choices when comes to cloud based services. Pureplay Cloud Applications: While nonprofit sector have so many different types of data management need such as operation, accounting, donation and beneficiary. Nonprofit sector is still lagging significantly when comes to innovation in data management. Most of the innovative products have come out in the area of accounting and donation management. Needless to say 90% of vendor focus in these area leaving operation and program/beneficiary data management up to non-profit IT managers themselves. Platform oriented Cloud Applications: While many were struggling with IT implementation back in 1990s, internet revolution brought several important innovative approach. Salesforce which started delivering Customer Resource Manage (traditionally lead by server based products from leaders such as Siebel, Oracle and Microsoft). While Salesforce have now become leader in CRM, the real revolution has been ability to provide flexible platform for customers to build their own internal data and process architecture in the cloud with relatively easier development (compared to traditional programmatic application) environment. While most of early start comes from non-profit customers with donation management such as salesforce nonprofit success pack (Salesforce NPSP), many of them have been starting to focus on expanding integrated donation system and integrated beneficiary/client tracking system. Nonprofit marketing teams finds that Salesforces's easy configuration that let them track donor insights and life cycle by analyzing different trends in donor cycle. How can we demonstrate value of volunteering with an organization and convert them in a lifelong donor or even board member. What cause are important to your donor demographics? How do we expand to new donor demographic sympathetic to your cause? Any detail that was relevant to a specific to specific charity outcome or results could be reported on to a specific donor or donor programs through individual reporting or impact reports on their websites. While many start with a free Salesforce grant of 10-Salesforce CRM user license and non-profit success pack (NPSP), a popular open sourced fund raising application from Salesforce. Many start with Salesforce CRM, and open sourced NPSP for fundrasing and volunteer management, they grow to creating many internal application such as asset management, support and ticket tracking and deploying from hundreds of applications on Salesforce AppExchange. While Salesforce is not just for non-profit marketing and fund raising, their use suddenly starts to grow to manage application process, automatic payment process, social media integration, accounting and even automatically reporting grants outcome to the large funders. As you start to grow your footprint with the Salesforce, soon you should create roadmap? What are different marketing priorities? What are operations priorities? 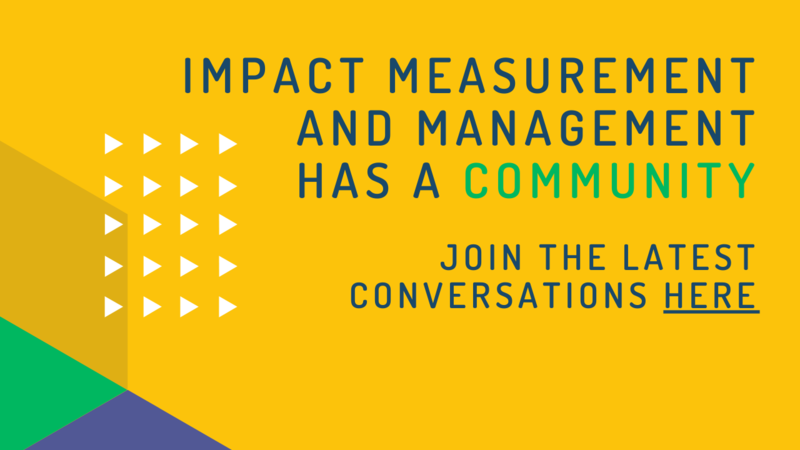 and how you should communicate your impact effectively?